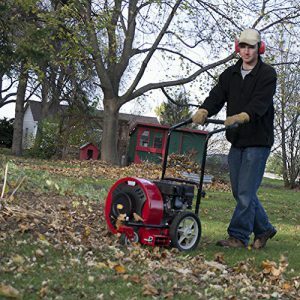 Clearing leaves on a large property can be a huge job, but less work if you have a good blower in your arsenal. If you’re looking for power and longevity of use, you’ll want to pick up one of the best gas powered leaf blowers. 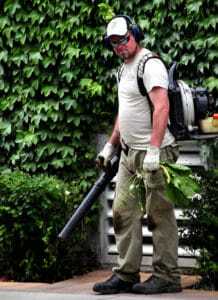 There are different types and styles of gas powered leaf blowers available. Selecting the right one for YOU can help ensure you’re happy with your purchase. I’ll show you what you need to consider, and teach you to interpret the specs on the packaging – after you’ll see my top picks for the year. I’m sure by the time you’re done reading you’ll see a blower that you love. 1) Style: What Type Of Blower Do I Want? There are 3 main categories of gas powered blowers: Handheld, Backpack, and Wheeled Leaf Blowers. Very briefly, Handhelds are your most economic, the lightest, and the least powerful of the 3 styles carried solely by the strength of your arm. Wheeled (also known as Walk Behind Leaf Blowers) are your most expensive, heaviest, and most powerful – you push or pull these machines along the ground. Backpack models (which no surprise, are carried on your back via a harness) fall in the middle, and are the ones that you see most professional landscape companies using. 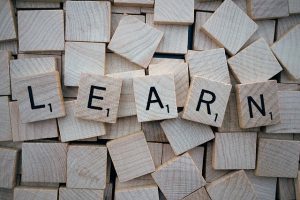 CLICK HERE to jump down to my fuller explanation of the 3 styles, if you’re unfamiliar with them, or want some tips on which category you personally should focus in on. 2) Blower Power: How Do I Interpret The Product Specs? When you’re shopping for a gas powered blower, there are quite a few specs listed that aren’t always easy for the average person to make sense of, so I’m going to help you out by giving you a layman’s explanation of the main ones. When you can make sense of the specs, you can find out how powerful the blower you’re looking at will be, and there will be no surprises when you start it up for the first time. So, to figure out how powerful a machine is (especially in comparison to other blowers), you need to look both at the engine and at how the air moves through the tube. 2 stroke or 4 stroke: Refers to the movements of the piston inside the cylinder during combustion (when the air meets the fuel and ignites). 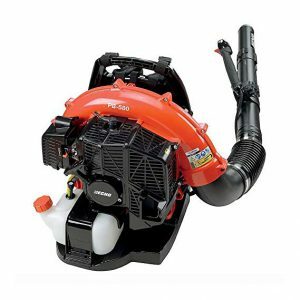 Most gas powered blowers are 2 stroke (2 cycle) although some do come as 4 stroke (4 cycle). The main thing you’ll need to know is that 2 stroke engines require a fuel that is a combination of oil and gas fuel, while 4 stroke engines use just gas. Learn more about the other differences by skipping down to my fuller explanation of 2 stroke vs 4 stroke engines. “cc”: cubic centimeters. It’s the metric unit used to describe engine capacity (volume or size of the engine, if you will). The number does not describe power – just the “room” it has for combustion. “L”: Litre. 1000 cc is equivalent to 1.0 L.
“Cylinders”: The “canister(s)” where air and fuel mix and ignite (and power is produced). Key Point #1: The bigger the engine capacity (the more cc’s), the higher the power output. Simply put, bigger engine = more power possible. Thus, handhelds simply can’t equal backpacks for power, for example, as their engines are smaller. Key Point #2: Engine capacity affects fuel consumption adversely. That means that the bigger the engine capacity, the lower the “mileage” you’ll get from the gas you put in… or very simply put, it takes more gas to run a bigger engine. Cfm stands for cubic feet per minute, and it refers to the volume of air coming out. 500 cfm means that every minute, 500 cubic feet of air is being pushed through the nozzle. MPH stands for miles per hour, and it refers to the speed at which that air is blowing out of the tube. 175 mph means that the air coming out of the nozzle is zipping by at 175 mph. So, how do putting MPH and cfm together determine power? Your most powerful leaf blower will have both a high MPH and a high cfm, which will mean, in basic terms, that LOTS of air is being pushed out at a HIGH speed. To compare the power of various units, grab a calculator and multiply the MPH and the cfm together of each of the units you’re looking at. The higher number has the higher power (has more air pushed out at a high speed than the other). If a unit has a high MPH but low cfm, it means that the unit pushed out LESS AIR even though it’s coming out very fast. You want both if you want lots of power. Now let’s take a look at my top picks for 2019: first Handheld, then Backpack, then Wheeled Gas Blowers. The Ryobi Jet Fan Blower is the most powerful gas handheld blower we’re looking at today, and is my top recommendation in this category. This blower has a fantastic combination of air speed and quantity of air movement. On full blast, you’ll be shocked at just how insanely powerful it is! You’ll also appreciate that there’s a variable speed trigger that lets you turn it lower when needed though (delicate flower bed don’t need gale force winds). The blower has an “innovative 3 stage jet design”, which is a fancy way of telling you that they have designed the shape of the tube to maximize the air flow coming out. You can run for a full hour + on a tank, meaning you can get a LOT done! Reviewers on Amazon and elsewhere say it consistently starts quickly! The Ryobi also comes with a 3 year warranty so you can trust that your purchase will be an effective part of your yard tool collection for some time – and worth your investment. I really like this blower and think it’s one of the best you can get, especially if you’re looking for something that has great air movement. It’s fairly priced for the value, about mid-range. Well worth a closer look. 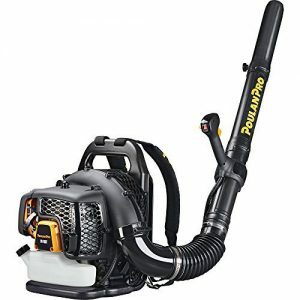 This Poulan here is your best “economy” model, so if you’re looking to get a powerful blower that’s a bit more on the cheaper side, take a good look at this one. Although it is pretty basic model, it definitely will do the job, as it has a decent sized engine, and in my set of best gas powered handheld blowers here, it comes in 2nd when power of air output. It does have variable speed (you can control the air flow), but it does NOT have “cruise control”. Instead, it has a trigger throttle which you’ll need to hold down for the unit to work. The handle is soft-grip and comfortable. The Poulan PLB26 is quite lightweight at only 9.5lbs (making this a model to consider if you’re picking out a blower for someone who may benefit from something lighter). I wouldn’t quite say 9.5lbs is super LIGHT though – just a heads up if you’re going to be asking someone to carry it for longer lengths of time. The blower pipe is adjustable/removable, so you can have it long, short, or off entirely. The Poulan has a standard choke carburetor and a spring-assisted starting system – if you’re curious about the finer details. This Poulan handheld blower option is a powerful, yet fairly basic model leaf blower that comes at a price most people can afford. And as it includes a 2 year limited warranty, I think you can definitely feel good with this option. The Hitachi Tanaka is a product that a lot of people love and that has fairly high customer ratings on Amazon. The Tenaka is one of the lightest models available at 8.6lbs and has a well-balanced design that lets you carry it comfortably for longer periods of time (so if you aren’t ready for a backpack blower just yet, but know you’ll be using it a fair bit, this unit should be high on your list of possibilities). It has a low emission Pure Fire II engine that is simple and reliably quick to start. This model is also available with vacuum, if you’re looking for that option! The nozzle has a carefully designed taper to direct air precisely where you want it… and the taper forces the air out at an impressive 170 MPH! It has a large 2-finger trigger throttle that you use to operate it easily. No “cruise control” unfortunately. It comes with an absolutely incredible 7 year “consumer use” warranty, so you know you’ll be getting great value out of your investment. 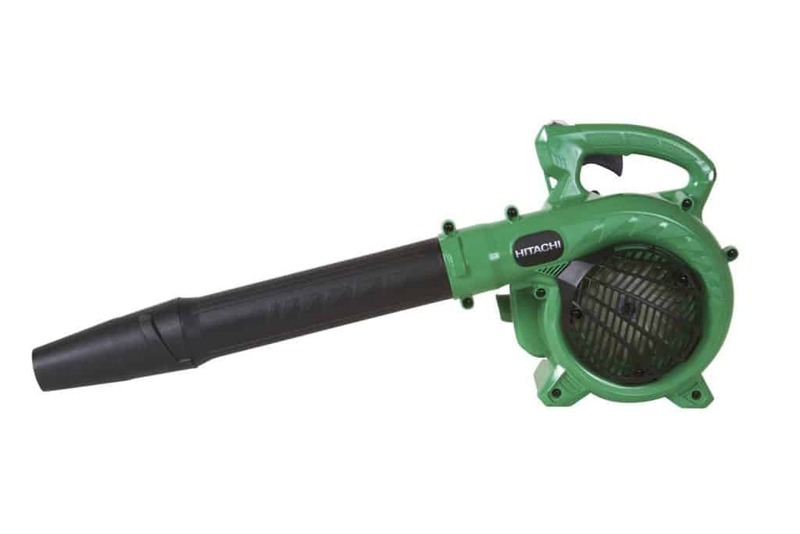 You already saw the Hitachi Tenaka, and now it’s time to take a quick look at the Hitachi RB24EAP – one of the most popular hand held gas blowers on Amazon right now… by far. The RB24EAP is rated a commercial grade model and has a 2 year “commercial use” warranty alongside the 7 year “consumer use” warranty… and a 1 year “rental use” warranty besides. It is listed as CARB compliant and is certified to 300 hours by the EPA – it’s highest useful life rating. It comes in at a slightly CHEAPER price. Win, win! Here we have another well made and high quality blower, this one by the a company well known in the world of lawn maintenance tools (at least where I come from): Husqvarna. The Husqvarna 125B handheld blower has lower numbers when it comes to the actual power output compared to some of the models we’ve reviewed, but it is a well designed and still very powerful unit. There is a second, fan-shaped tube attachment (not pictured here) that comes with the unit, and if you’re looking for a really hard hit of air for a tough job, adding it to your air tube will give you an extra boost of power as the same air is forced through the smaller opening! It’s designed with your comfort in mind: the fan housing was placed directly in line with the handle, which makes it less stressful on your wrist and arm to carry for longer periods of time. It’s well balanced and ergonomically comfortable too, with “anti-vibration dampeners” built into the handle. After you stop the blower, the switch automatically resets to the “ON” position to allow you to start it in one step again. Once you set your desired air speed (variable, throttle control), you can set it into “cruise control” and get to work! Husqvarna’s X-TORQ engine technology helps protect the environment: they have reduced harmful exhaust emissions by up to 75% and fuel efficiency increased by up to 20%. Echo is also a well known brand for lawn maintenance tools, with many devoted fans. You’ll find that this is a good quality, powerful blower, even though out of the 6 best handheld blowers I’m covering here it does come in with the least power based on air movement & speed. It has cruise control, which gives you the option to work at your chosen speed without having to hold the trigger all the time. Reviewers note it’s consistently easy to start, lightweight, and comfortable to use. Overall, the Echo 250LN is a solid choice. It is a bit on the higher end of the pricing scale, but it’s not cheap quality – you should be happy with this one. 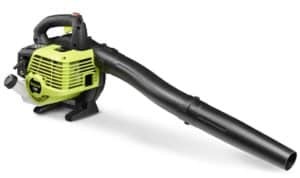 If you’re either a homeowner with a large yard of leaves to blow, or a landscape professional looking for a reliable, powerful backpack gas powered leaf blower, my top recommendation is this Husqvarna 350BT. 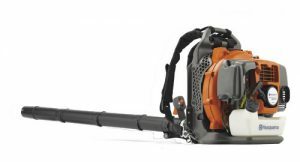 There is a fairly extensive range of Husqvarna blowers – they make a great product, and have it available with a variety of engine sizes and air speeds. The 350BT is one of their most popular models as it gives you a fantastic combination of engine capacity and air speed/power. The harness/contraption is very well designed. 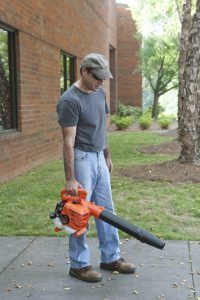 It’s comfortable, ventilated, and has wide shoulder straps and a hip belt, making it a good choice if you have large lawns to blow and expect you’ll be wearing the blower for quite a while. The handle is also soft-grip and adjustable – basically the blower designed to allow you to be as comfortable as possible while wearing it. You can set the fan speed and just get to work, no need to hold down a trigger. Throttle controls are conveniently located though, right on the tube. There’s a handy air purge that you can run that removes air from the carburetor and fuel system so that starting it is always easy. Interesting bonus offered by Husqvarna: If you purchase the 350BT along with three 32oz cans of Husqvarna pre-mix fuel (in the same purchase) and register your product online, you can get your consumer warranty extended from 2 years to 4 years! This model is currently listed as Amazon’s Choice for “backpack blower” out of all of the models out there right now, meaning it’s a top quality product with few returns, high ratings, and happy customers. I’d recommend this as my top choice for a backpack blower too, but if you’re looking for something a bit cheaper, there are definitely other good options. We saw the Echo handheld blower above, a solid choice. 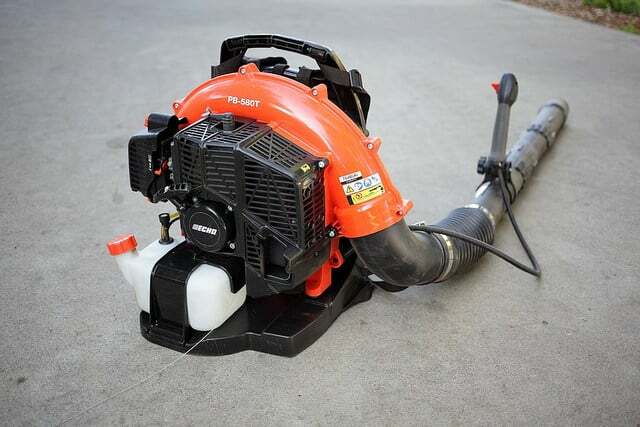 Their backpack blower (model PB-580) comes in high on the best choices list as well. The Echo PB-580 comes in a T or H model. “T” indicates that the throttle is located on the tube, “H” indicates that it is found near the left hip. As more reviewers seem to prefer the Tube model (PB-580T, for reasons such as a singular fluid motion, or allowing the left hand to be free), the link is to that one. It’s easy to find the H model as well if a throttle located near the hip is your personal preference. The padded back rest and shoulder straps are designed to allow air to circulate around you even as you wear it, a feature you’ll particularly appreciate when blowing during hot weather! There’s a leaf guard that stops leaves and other debris from blocking the blower intake – this prevents overheating, which of course isn’t very good for your machine. It has a translucent fuel tank that lets you easily see the fuel levels (the fuel tank is also quite large… 62 oz capacity). The engine is professional grade, and serious powerful. The Poulan Pro is Poulan’s best backpack blower option, and although it’s not QUITE as powerful as the Echo above, it’s a blower that gets the job done and is a solid option, especially for those of you looking for a budget friendly choice. Although it’s compact, it still has some high performance features that you’ll like such as cruise control and variable speed control. The air speed is very high… although the engine size isn’t as large as some of the others, you will be amazed at how it can clear wet and heavy debris. 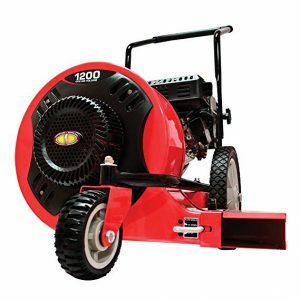 The Poulan Pro is possibly NOT the model you should pick if you’re a landscaper hoping to use this blower all day long – Poulan itself says that it’s designed more for part time or residential homeowner use – it’s not a commercial grade blower. However, that being said, it’s still a powerful backpack blower, and a great deal. If you don’t need a commercial grade model, you should be happy with this one. 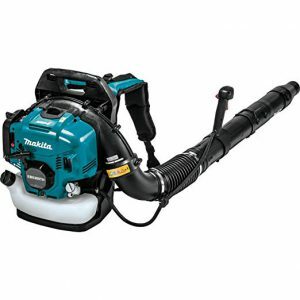 The Makita MM4 backpack blower is one of the few 4 stroke gas blowers on this list – if you’re one who does NOT want to be fussing with mixing gas and oil to fuel up, you might do well to pay attention to this highly reviewed blower, made by a reputable and quality company. It’s surprisingly quiet compared to many other gas powered units, which is something you and your neighbours will appreciate (there’s a large capacity muffler that stifles the noise). 4 stroke engines burn cleaner, are more fuel efficient, and are definitely more convenient as you only need to fuel up with unleaded gas. There is a mechanical automatic engine decompression feature, which makes starting it easier (compared to the recoil style starts). It’s the lightest on this list, at less than 20lbs. I think you’ll also appreciate the heavy-duty anti-vibration mounts between the frame and the engine, and the wide padded straps and padded back panel; it’s designed to be a pretty comfortable carry, even if you’re at work with it for a longer time. The Makita backpack blower isn’t a model I’d consider cheap, but you don’t want something cheap and not built to last if you’re shopping for a blower to add to your outdoor tools collection. You want quality, and Makita is a brand known for quality. When it comes to wheeled leaf blowers, there aren’t as many highly rated options to choose from, unfortunately, but this option by Troy Bilt is one of the few that comes with good reviews across the board and a solid warranty (2 years, limited). It also has some incredible power… pushing 1,000 cubic feet of air out at speeds up to 150 mph. That’s pretty incredible – almost 4 times that of a backpack. Wet leaves, pine needles, or stubborn debris, no problem. The output impeller sits at 14 inches high, and you’ll like that it’s designed also for proper and safe ventilation on the intake as well (1,000 cfm is a LOT of air that’s being moved). 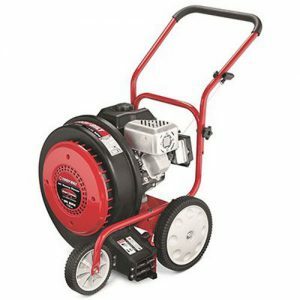 The blower rolls quite easily using semi-pneumatic ball-bearing wheels (8″ x 2″ S-wave front and 12″ x 2″ S-wave rear), so you won’t have to strain to move it where desired. The handle has a rubberized grip so you can hold and maneuver it comfortably. It has a 3 quart fuel capacity, so you won’t have to stop for refueling breaks every few minutes. Overall, if you’re looking for a wheeled or walk behind gas powered leaf blower, the Troy Bilt is one of the top options out there. It’s not a cheap item, but with the power that you’re looking for in a walk behind blower, you need a quality engine. The Southland Wheeled leaf blower is another great choice if you’re looking for a serious gas powered leaf blower. Of all of the blowers on this list, it pushes the most air at the highest speeds. The engine has 6.5 foot/pounds of torque -that’s some serious power! You can direct the air chute 15 degrees to steer the air flow where you want it. It has 12″ rear wheels that make it easier to push the heavy weight of the machine, and the front swivel wheel allows for smart and simple steering. It’s easy to start (with manual recoil) and operate – it even comes preassembled! There are many different gas powered leaf blowers on the market, but I think that you’ll be more than happy with one of these top 12 options above. There’s a good range of prices, power levels, and styles, something for anyone. Three points to remember are 1) that when you buy any model, you’ll need to also purchase gas & oil (or pre-mixed) for 2 stroke engines or gas for 4 stroke. 2) Not all models can be serviced at all generic service centers – it’s worth checking into the brands that can be serviced at your local center if you’re not close to a large city so you don’t suddenly need to drive a long ways to get it looked at. And 3) Most mailing/shipping companies won’t ship units that have gas and or oil in the engine already… just a heads up. 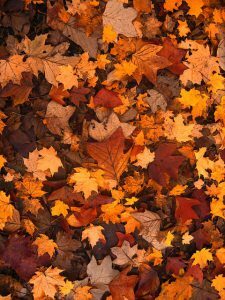 A leaf blower will be a great addition to your tool collection, especially during the autumn when the yards are covered with leafs and debris. 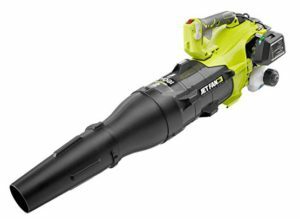 Spring clean up as well will be a snap with a blower in your arsenal. Don’t forget that there are other types of blowers as well, if you aren’t sold on gas powered. If you don’t have a huge yard, check out this post here to see if perhaps a battery powered option would be better suited for you! There are 3 main categories of gas powered blowers: Handheld, Backpack, and Wheeled Leaf Blowers. Let’s take a deeper look at each and see what they are, and why you should (or should NOT) buy one of these. Handheld blowers are the smallest and lightest of the 3 blower styles, and also your most economical option. They are designed to be light enough to maneuver quite easily, carried fully in your hands much like a battery operated or electric blower. 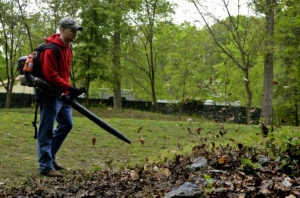 You should consider a handheld gas powered leaf blower if your main use will be to blow out flowerbeds, remove grass clippings from sidewalks and driveways, and clear leaves from smaller sized lawns. If you have a bigger yard with lots of trees, you may discover your arm tiring well before your yard is done (handheld blowers run between 8-12 lbs, plus fuel weight). Handheld blowers do have smaller engines than the other styles two styles… which means less power and air flow, and thus more time required to get the job done. If you go this route, you can not expect the same crazy power of a blower with a larger engine (backpack, for instance). If you need to do a fair bit of blowing and want something that you won’t tire of carrying as quickly, consider purchasing a backpack gas leaf blower. The engines are bigger and thus heavier than those of handheld blowers (approx. 20lbs compared to approx. 10lbs), but they come with an ergonomic harness that spreads the weight across your back and shoulders, freeing your hands to control the air tube. Backpack gas powered leaf blowers are serious units that blow a LOT of air at some very high speeds. They get the job done quickly and can move even wet leaves, gravel, and other debris from larger spaces. If you’re just wanting a blower to do some clean up work on a smaller urban property, you likely do not need a backpack blower. 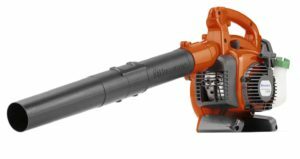 (You actually may want to also consider taking a look at reviews of the best battery powered leaf blowers along side the handheld gas options). If you have a very large, rural yard, and spend more than 30 minutes with a backpack style model, you may want to move up to a wheeled gas powered blower, also known as a walk-behind gas blower. These are incredibly powerful and can clear a yard of leaves much quicker than even the best backpack leaf blower. However, they are also very heavy and cumbersome (sometimes over 100lbs), so they are definitely best suited for flat yards where you don’t need to maneuver them all that much, and where you don’t necessarily need the leaves blown into nice, neat piles. Wheeled blowers are also the priciest of the styles, and have the lowest fuel efficiency – yet they are often 4 stroke (meaning straight gas, not a gas/oil combination). Here’s a handy video looking at all of the styles. Some of the product recommendations may be different than mine, but keep in mind that it’s a video from 3 years ago. It does cover the styles well though. What is the difference between 2 stroke and 4 stroke engines? To learn even more about this, click here. Hi, I like your great and very informative review. Now I know so much about the different gas leaf blowers, I need to overthink which kind would be best for my backyard. What would you suggest for an older man with a medium area to keep clean? Thanks for your question. It’s a bit of a tricky one though, as many older men I know can outlift or at the least keep up with the younger. Handhelds are your lightest option though, if that’s what you’re asking. But depending on how big your medium yard is and how many trees packed with leaves are on that property, I’d say a good rule of thumb is if it takes over half an hour with a handheld, move up to a backpack blower or your arm will be rather sore, no matter how old you are. If this is your first gas blower, and you just aren’t sure you need a backpack sized model, perhaps try out the handheld to start. Any of the models are good choices here – but personally, I’d recommend taking a good look at the Ryobi (my top recommendation for the handhelds). It covers all the bases. Wow. Thanks for taking all the questions out of my head when selecting a backpack blower. I used to stay in a property that really needs one but it was left behind for my brother to stay in. And he’ll be interested to know the reviews you have done here. I’ll surely forward this to him. Thanks for the comment, ht. Glad this post about gas blowers was helpful for you – and hopefully others too! Thanks for passing it on!